The success of your financial achievements depends on how effectively you work on your financial planning and the efforts you are taken to achieve your financial goals. But things may not always go as per your plan. Hence you may have to take a step back and review and revise your financial plan, especially when you reach the age of 40. In your 40s, you are at a point of life where you can exert good command over the future. Hence, you might want to revise or rework on some of your financial plan goals. But to make a list you need to first have a set of checkpoints. If you have not started planning for retirement at this point in time, then it is high time you invest in one because you are possibly already late, anyways. An existing retirement plan needs a re-check, in the sense see where you can maximize current retirement plans. Find out better and more options to save for your old age. An overwhelming sum right now may be blown away in a couple of years while meeting retirement age. So, try to invest more on retirement plans, but be careful about your investment decisions because one wrong move can financially hurt you much more than it would have in your 20s. First two decades of earning may be a phase where you spend more generously as you tend to be excited about the cash inflow. But now there is a need to reduce those flaunting expenses like being brand savvy, lavish dinners, partying often and even looking out for luxury in every aspect of life. Try to save more as and when you reach a better position in the job every time. Be it a credit card bill or a personal loan try to clear it off within a planned time frame. From now on try to lead a life free of debts. 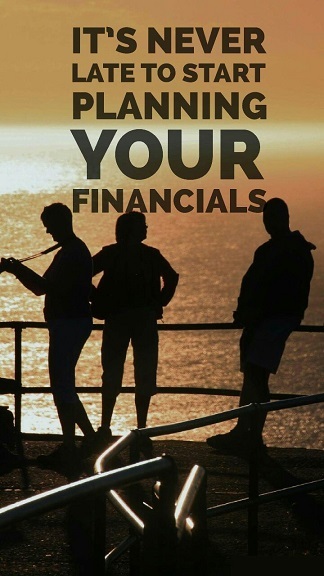 Control on unnecessary expenses that will help you be debt free. Of course, this does not mean that you need to lead a thrifty existence. You need to definitely enjoy the benefits of your hard-earned money but you should equally remember that you need to save for your post-retirement life. At this age you are no longer an energetic and dynamic youth, you are more determined and responsible towards life. So, there should always be space to save for emergencies. Save a nominal sum every month to meet the emergencies that arise out of a life full of surprises. You should have already started this practice in your 20s, but remember to revisit your emergency funds (especially your health plans) and see if you can increase your contribution. If you have mastered the art of stock exchange by now, then probably you can invest in more stocks and bonds. Whereas, if you are struggling to understand the functioning of the stock market, it is not your cup of tea. In that case, either try to invest in stocks with the help of a professional or just drop down the idea of earning through stocks. An insurance that you bought when you just started earning would just be a small package. So, it is better to have a better and updated insurance plan for better coverage. Now that there is a considerable improvement in the income, investing in insurance which gives better produce is advisable. But of course, before you make all your investment plans remember to take the support of an expert investment advisor, or better, a financial advisor in India, who can support you in selecting the financial goals best suited for your current situation. Although most of you would be well on your way to achieving your life goals by your 40s, it is crucial to identify the possibility of developing further skill sets to go further up the ladder – a new business idea, skills currently in demand in your area of expertise that will help you grow, or a completely new skill set that can open up new avenues of earning. Think of this learning as an investment for the future, when you can even use the learned skills as means of livelihood post-retirement. When you follow the above check points right when you start your 40s, you will surely be able to make your 50s a peaceful decade. In the sense ten years down the line, you can see good progress in your financial plans and feel secured. Get started with these little steps from your 40s today. Connect with Prognoadvisor.com to understand what your financial investment options are and how you can make your money grow with confidence in your 40s.